Please if you find any problems E-mail frank@fishinfranks.com So I can try to find the problems. Aiden my son and our junior angler, had yet to catch a shark over 4 feet. We had talked about heading over to find him some Atlantic sharp-nose or some smaller black tips. The water is very HOT and I was wondering if we were going to be successful, especially since we were kind of on a time crunch today! 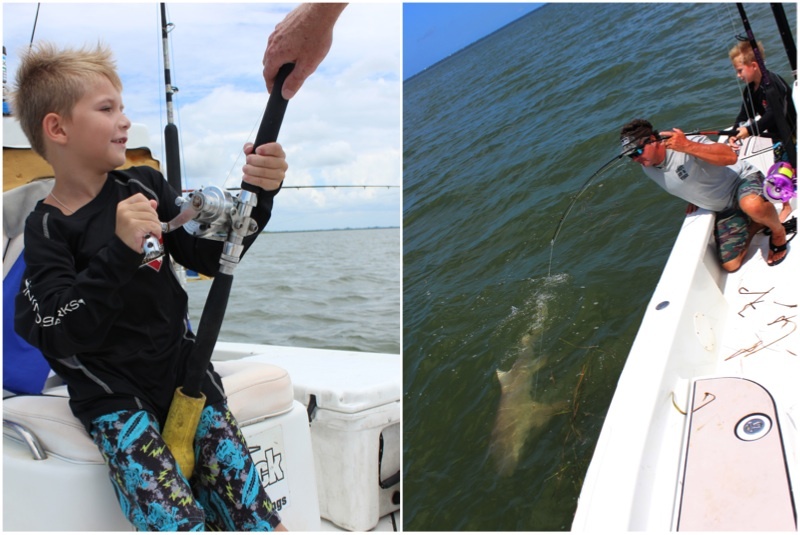 We netted some fresh bait and set up three shark rods around the boat. Now its a waiting game. We amused ourselves while waiting by getting Aiden to bite a head off a fish for good luck, well I guess it worked! The rod in the back starts screaming, I pick it up and set hook to notice well this is slightly larger than a blacktip! Aiden handled it like a pro! Fighting his first big shark with the best crew around! After about a 15 min fight Aiden lands a 6 foot lemon shark, pretty impressive for a 7 year old! The look on his face when he saw the size of his shark was great! Lemon shark was tagged for NOAA Cooperative Shark Tagging Program and released after a few quick pictures. Such a fun day on the water with great friends! All these fish by 2pm, home in time for dinner with a great fish story to tell. Special thanks to Captain Bo Johnson & Tenacity guide service for making Aiden’s day! Talpia in the Peace river, this used to be common and those of us who fished for big Snook could not wait until they would come in each year, I think the lack of rain is why we have not seen them, You eat the big ones but the millions of little ones make the best snook and tarpon bait you can find for fishing in the Rivers, almost guaranteed fish. This morning Andrew headed out with Reel Addiction Charters they set out into the back waters of Port Charlotte. It’s beautiful just as the sun is coming up and the fish start to feed. Almost like the calm before the storm, a calm glassy surface. Then you start to see the bait wake up and move around. Look for glass minnows and your sure to start to see fish feeding. That’s also the perfect time to cast your fly into the water. Andrew took up fly fishing just a few months ago, its been quite challenging to find a good location for this. You need to learn to be a great caster and have plenty of room behind you. Not too easy on the beaches we hang out on , always people walking behind you. 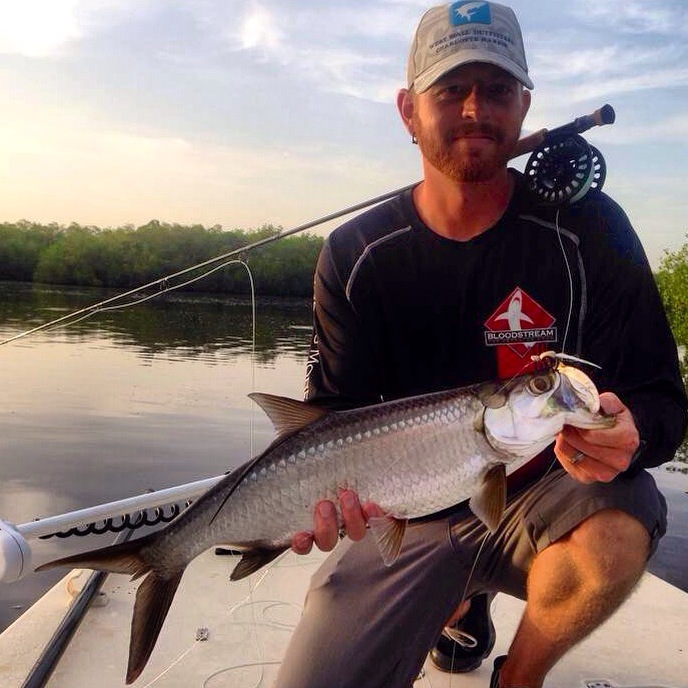 After a few weeks of trying Andrew finally had the perfect conditions and landed his first tarpon on the fly, using a fly he tied himself! He was using a 8wt rod and reel. With attached 30lb fluorocarbon. Andrew also landed a nice snook to finish out the day! Make sure you check out Captain Scotts’s most recent article on tarpon fishing in this month’s Water Life Magazine on stands now! Editor’s note: This column first appeared in the October 31, 2013 edition of WaterLine Magazine. If you leave your gear unattended and don’t tie it to the railing, a strike from a big fish can send it flying into the drink, which is what happened to this Penn reel caught at Laishley Pier. If you haven’t embarrassed yourself while fishing lately, you need to get out more. Let’s face it, we’ve all been there. From throwing a castnet on top of an oyster bar to casting off the perfect — and only — live whiting we’ll catch that day, dumb moves abound when you’re fishing. For you, it’s a sinking feeling. For the people around you, it can be rather funny. And while I try not to laugh at folks, sometimes I just can’t help it — usually because it reminds me of some bonehead move that I’ve pulled off before. And I’ve had my share of laughable mishaps on the pier. So here’s a list of things you should try to avoid at all costs. Unlike me. But, hey, somebody’s got to experience them so you can learn from it. Good luck. I see you’re fishing for Jaws: This never fails to crack me up. I see some poor soul stroll out on the pier looking like he should be boarding the Cricket II instead, carrying a 12/0 Penn spooled with 150-pound braid and attached to a broomstick rod the biggest Goliath grouper in Charlotte Harbor couldn’t snap. He attaches a whole bonita to a 16/0 circle hook and proceeds to cast it out about 10 feet off the pier. I stifle a laugh the best I can. I’ve said it before and I’ll say it again: You’re not going to catch Jaws from a pier. At least not any pier around here. You want to throw that castnet where? : Judging by the number of castnets I’ve hooked — and landed, mind you — fishing from local piers, this seems to be a pretty common occurrence. Which is troubling. I’ve caught castnets at El Jobean, Placida and Laishley; three places you’ll never see me throw one. If I can’t see bottom or I don’t know the area like the back of my hand, I simply am not going to take the risk. But what do I know? Go ahead and throw blind where the current is strong and debris is plentiful. I’ll pretend I don’t see you trying to wrestle your net back from the dead. Of course it’s a good idea to put your rod down and drink a beer: Probably the most common offense in pier fishing is propping your rod up against the pier after you’ve cast out your bait and leaving it unattended. And it’s not a dual-drag reel. And you didn’t tie it to a piling. Or loosen the drag. Now it’s sailing over the railing and into the drink … ka-SPLOOSH! The sound of epic failure. If you’ve been burned by this phenomenon before, I guarantee you won’t make the same mistake again. It wounds your wallet as well as your pride. Oh, and good luck trying to catch your rig after it goes over. That’s for someone else to do, long after its been encrusted by barnacles. That cast didn’t go far enough. Reel in and try another: In the early days of my saltwater career, I was a habitual line-stepper when it came to casting. If I didn’t feel I had made the longest, most perfect cast possible, I panicked, reeled in and tried to fire it all the way across Charlotte Harbor on the next one. I’m surprised I never threw my shoulder out. And using a conventional reel only exacerbated this problem. I don’t know how many times I watched a perfectly good baitfish flying through the air in the opposite direction of my line. It’s a pier. Unless you are casting 100-plus yards, it really doesn’t matter. Saltwater catfish are harmless, right? : Yup. So go ahead and step on that one to get it to stop squirming. Oh, what’s that you say? Its fin went through your boot and is now lodged in your foot? Nothing screams “Free Trip to the Emergency Room” like mishandling a catfish. You can take it from me. I didn’t earn the nickname “Ol’ Catfish Finger” for nothing. Birds are not in season: This one seems easy to avoid, but if you’ve fished long enough, you’ve hooked a bird. Sometimes you just can’t avoid it if they fly directly into your line. From seagulls to pelicans, birds can be annoying. But continuing to fish when they’re dive-bombing your lure or trying to inhale your live bait is asking for trouble. And in that case, it’s not the bird’s fault — it’s the angler’s. If you do hook a bird, please do not just cut the line. Reel it in gently, cover its head with a towel or shirt to calm it down and remove the hook. The dock is the perfect place to clean your gear: Right up to the point where the spool from your brand-new Penn Conquer 5000 goes rolling into the Harbor. How would I know that, you ask? Silly question. 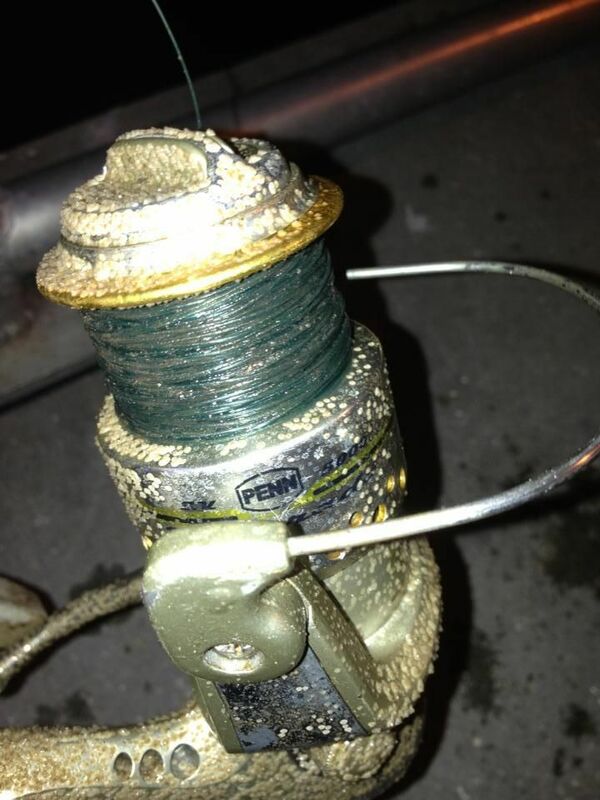 Here’s a snippet from a 2011 misadventure: As the spool hit the dock it plotted a one-way course toward the edge. It could have just as easily rolled into the grass, but no, it had made up its mind. I watched helplessly, frozen in my chair, as the spool slid right off the dock and into the drink. Splash! … “Doh!” (Homer Simpson voice). Pier net? What’s that? : If you’ve ever tried to haul a keeper snook up over the side of the railing and snapped your line, you know the answer to this question. Wherever I go, whatever I’m fishing for, I always bring my pier net just in case. It amazes me that more people don’t have one. And while I’m always willing to help someone land a fish if they need assistance, I might just have to start charging one of these days. Why, yes, I am going to fish 10 poles at once: What could possibly go wrong? Besides being rude to anyone else who might just want to fish on the same pier, having too many lines out in the water is basically begging for something to go wrong. The scene that comes to my mind involves hooking a big fish and having it pull you into your other rods, starting a domino effect that ends up with the fish getting away and you trying to untangle the massive mess you made for the next hour. I can just use my freshwater gear, right? : While some lures, gear and techniques flow seamlessly between freshwater and saltwater angling, I don’t advise making them interchangeable. For instance, if you’re the guy I’ve seen on the pier with a tackle box full of freshwater gear wondering why you’re not catching anything, you might want to rethink your approach. I’ve seen a lot of “Yankee” rigs (hey, I’m from Indiana — I can say that) wrapped around pilings and have gotten snagged on them bottom fishing. If you want to catch saltwater fish, fish saltwater. Until next time, hook ‘em up and fight ‘em hard. Fish on, fellow anglers.